Should you be soaking nuts and seeds before you eat them? Why do so many raw vegan recipes say to soak nuts before using them? What are the advantages? 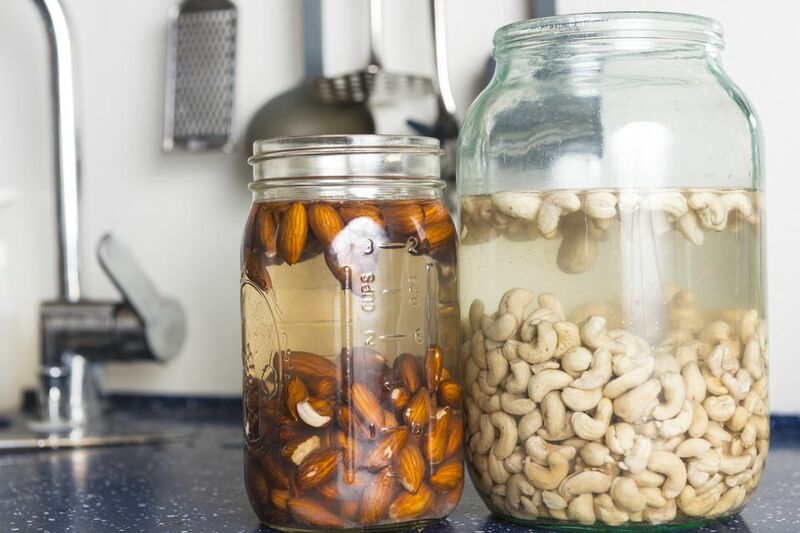 How do you soak nuts and seeds? Many raw food recipes call for soaked nuts or seeds. There are several reasons for soaking nuts ranging from flavor to increased nutritional value. Sometimes it is simply to prepare the food to be soft enough that it will blend more smoothly. Many raw vegan recipes use blended up nuts in ways that other recipes do not, either to make raw nut milk or to simulate baked goods, like cookies and pies. Even if you're not on a raw vegan diet, one terrific reason to soak nuts is that many nuts, especially walnuts and almonds, have a much more appealing taste after they are soaked and rinsed. As you will see if you try it yourself, after as little as 20 minutes the soak water is brown. After a couple of hours, much of the dust, residue, and tannins from the skins are released into the water and the nut emerges with a smoother, more palatable flavor. You'll notice that soaked walnuts do not have that astringent, mouth-puckering taste to them. This is because when soaking walnuts, the tannins are rinsed away, leaving behind a softer, more buttery nut. The soak water from nuts and seeds should always be discarded and never used as water in a recipe. Other reputed benefits of soaking your nuts and seeds include increased enzyme activity, greater absorption of the food's nutrients by the body and increased digestibility. When soaked, nuts and seeds will begin the sprouting process, which bumps up their nutrient profile considerably. Nuts should only be soaked after they are removed from their shells. You'll notice that nuts without skins such as macadamias, cashews or Brazil nuts don't have as much of the murky water residue, but soaking is still recommended for ease in blending and for nutritional purposes. Convinced you should be soaking your nuts and seeds? Great! Now you need to know how to soak your nuts before using them. Soak your nuts and seeds anywhere from 20 minutes to 2 or 3 hours, or even overnight in the refrigerator. In general, harder nuts will take longer to soften. If your recipe calls for soaked nuts or seeds and you are low on time, try to squeeze in 20 minutes minimum, or just do a really good job rinsing them. Otherwise, plan ahead a bit and soak them overnight in your refrigerator in a glass container with an airtight lid. Quick tip: Soaking nuts in plastic is generally not recommended as plastic can leach into the water and into your food. Many raw foodists will keep a variety of nuts and seeds soaking in their refrigerators at all times to have handy. If you do this, you'll want to change the soak water every couple of days so that the food doesn't spoil.